Developing applications using Kinect for Windows SDK is always fun and interesting. Recently I have shared couple of cool tips and tricks on Kinect for Windows SDK. You may found helpful for your day to day Kinect for Windows SDK based development. Microsoft User Group Hyderabad (MUGH ) invites you to monthly User Group Meet on 23rd Feb’13 . This monthly UG meet scheduled on coming Saturday (23rd Feb – from 9:00 A.M ) at Infotech Enterprises Ltd, Hyderabad. I will be delivering a session on “Kinect for Windows SDK” and will talk about how we can build a gesture enabled and speech recognized application; this is what we called building Natural User Interface (NUI) application. I will also walk you through with different features of Kinect SDK such as capturing Infrared data Stream, Getting Sensor Accelerometer data, tracking human body joints and something around Face Tracking. In this post I am going to talk about how to capture the Infrared stream from the Kinect sensor and control the IR emitter using Kinect for Window SDK. This feature is available with the Kinect for Windows SDK v1.6. The major components for a Kinect device consists of a depth sensor, color camera, IR Emitter, and a set of microphones with everything secured inside box. The box is attached to a small motor working as the base that enables the device to be tilted. I am very happy and pleased to announce the availability of my book “Kinect for Windows SDK Programming Guide”. The purpose of this book is to explain how to develop applications using the Kinect for Windows SDK. 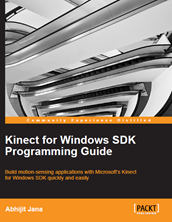 If you are a beginner and looking to start developing applications using the Kinect for Windows SDK, and if you want to build motion-sensing , speech-recognizing applications with Kinect, this book is for you. This book uses C# and WPF in the examples, so you need to know the basics of C# and WPF. If you are a student with basic C# programming knowledge and having basic understanding of WPF and interested to learn about Kinect SDK, you can also read this book. Building application using Kinect for Windows SDK. A practical step-by-step tutorial to make learning easy for a beginner. This is the fifth post in the series of Development With Kinect .NET SDK. In this post I am going to discuss about interacting with multiple Kinect devices with in a single system using Kinect .NET SDK. Before going forward, I will strongly recommend you to read my previous post where I have discussed about Connecting Multiple Kinect Devices with System which will help you setup your system with multiple devices. This is the fourth post in the series of Development With Kinect .NET SDK. In few of my previous posts I have covered Setting up Kinect Devices and Getting Started with Kinect Development ( Part I) , Exploring NUI APIs with Camera ( Part II) and Adjusting Kinect Camera Angle (Part III). Till now whatever I have covered, that comes under dealing with single Kinect devices. Let’s have some more fun with multiple Kinect devices. The Kinect .NET SDK does provide support for multiple Kinect devices. In this post I am going to discuss how you can configure two devices with your system. This is the Part III of my Kinect .NET SDK Development series post. In past two posts I have discussed about Installation of Kinect Devices along with setting up your development environment and Exploring NUI APIs with Camera. In this post I am going to cover some more fundamental stuff of Kinect Camera. Kinect .NET SDK provides some API to interact with motorized tilt ( Check out the device details section of first post for more information ) to enables the camera up (+27 Degree) or down (-27 degrees) . To adjust the motorized tilt you need to set the NUI Cameras ElevationAngle property to a value between –27 and +27. In my previous post Development With Kinect .NET SDK (Part I) – Installation and Development Environment Setup I discussed about fundamentals of Kinect sensors and developing application using Kinect .NET SDK. I also explained different types of API that mainly used for interacting with Kinect Device. Natural User interfaces (NUI) and Audio are the core APIs stack for Kinect sensors and and in the previous article we starts with NUI APIs. By this time you must know how to get start with of NUI API’s by initializing the runtime. Let’s take a inner look of NUI API. In this post I will discuss about NUI APIs for Kinect .NET SDK and will see how we can interact with Kinect Camera Sensors using it.